– in addition to regular client listeners, we have also showPopupBehavior elements, that we can use to tie a popup directly to a component; this will bring up the popup as a result of the specified action on the component, such as a RMB (right mouse button) click or a double click. In this article – and some subsequent posts over the next few days – I will demonstrate examples of each of these client oriented mechanisms and features in ADF 11g Rich Faces. Note that I ran into some issues as well – like programmatically display a popup multiple time does not seem to work (in TP2). 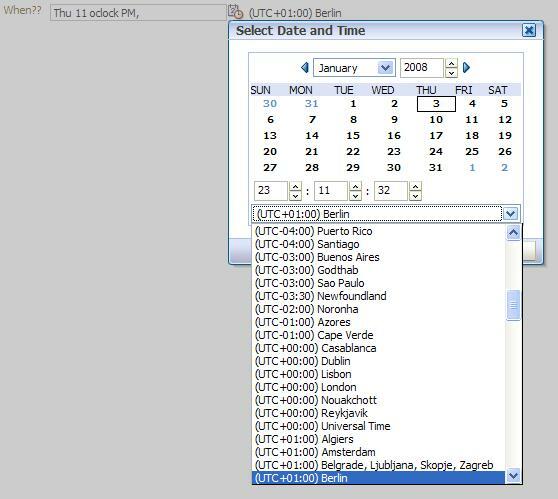 when the user right mouse button clicks on the date entry field, a popup is displayed in which the user can select the preferred date & time format to use for displaying the current Date and Time. The selectOneRadio component has autoSubmit set to true and the inputDate component has the id of the selectOneRadio included in its partialTriggers attribute. As a result, selecting a different format in the popup will immediately lead to a refresh of the display of the date and time. <af:selectItem label="Thu 10 o'clock PM, (UTC+01:00) Berlin"
value=" EE hh 'o''clock' a, zzzz"
<af:selectItem label=" Thu Jan 2008 22:36:56"
value=" E MMM yyyy HH:mm:ss"
<af:selectItem label="Thursday 3 January 10:36 PM"
value="EEEEEEEE d MMMMM hh:mm aaa"
ADF Faces – How to get a Client Side hook into the Partial Page Render cycle in order to embed rich UI widgets from Dojo, Yahoo and other into ADF Faces pages? I am using <af:inputdate component. 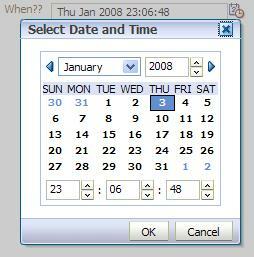 i am able to navigate to month & year fields in datepicker but not the days using keyboard keys. by default current day is highlighted. when i use arrow keys donâ€™t see cursor movements. Any pointers please. I am using <af:inputdate component. 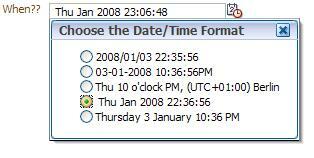 i am able to navigate to month & year fields in datepicker but not the days. by defalut current is highlighted. when i use arrow keys don’t see cursor movements. Any pointers please. Interesting but a shame the java methods being called were left out. This personally would have been REALLY useful to me!! !